“Not if!,” Vasyl Lomachenko corrects this writer, offended by the suggestion that what happens this Saturday at The Garden isn’t already written in stone. There is a surety to the WBA lightweight titleholder that comes along with being a two-time Olympic gold medalist, a world champion by his third fight, and three-division champion in his twelfth fight. He knows Jose Pedraza is a two-division champion, a stylish Puerto Rican who has had a pretty good career outside of the night when he wasn’t good at all. But there’s no doubt in Lomachenko that he will become unified champion this weekend live on ESPN (9 PM ET/ 6 PM PST). “His style is not very interesting and not comfortable for all boxers because he always sit on defense and waits your mistake…If you saw my fights, it will be the same like [Miguel] Marriaga. I think they have the same style,” said Lomachenko (11-1, 9 knockouts), comparing him to the fighter dropped twice in 2017 before he remained on his stool following the seventh. The next goal, Lomachenko says, is to become undisputed champion at lightweight the way his Ukrainian compatriot Oleksandr Usyk is at cruiserweight, a goal made more difficult by the confusing situation at 135 pounds. The IBF title is now vacant and will be filled by the winner of Richard Commey vs. Isa Chaniev. The fourth belt is held by WBC titleholder Mikey Garcia, who is stepping up to 147 pounds to face Errol Spence in March. More than just another step towards becoming undisputed. People know Lomachenko is great; Garcia would show just how great he is. Does he think Garcia has a real chance to win? No, no he does not. “I don’t like this idea. I don’t believe in Mikey Garcia winning, but this fight I will cheer for him,” said Lomachenko, whose English has improved since he first came to America, asking help from manager Egis Klimas when he’s searching for the right word. Lomachenko, 30, figures he’ll be stepping up again to 140 within a year in search of bigger challenges, but doesn’t want to do anything irrational like, say, jump straight to welterweight. “In my weight class and close to my weight class, we don’t have a big superstar. We have at 147 big names but I can’t move up to 147 now because it’s too much stupid I think,” said Lomachenko. One fight he’s not interested in, still, is a fight with Manny Pacquiao. “I don’t want to be a man who makes your name on an old legend,” he said, before adding that he’s not saying it because he’s scared or disrespecting the Filipino legend, who turns 40 this month. 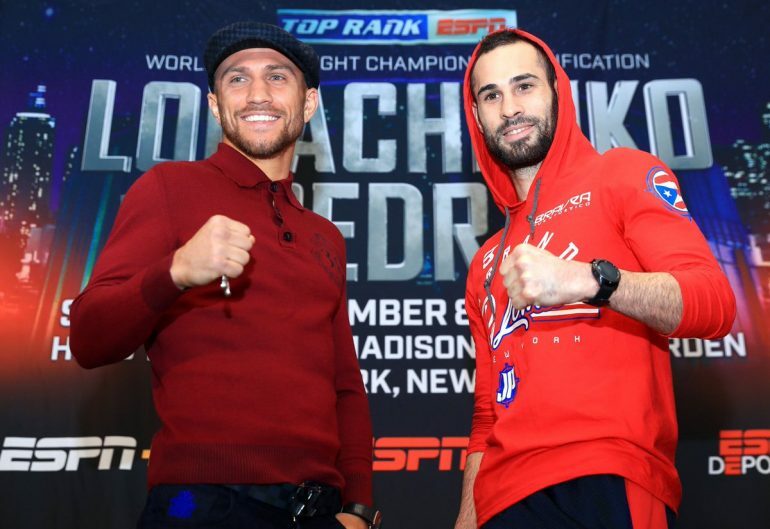 The Pedraza fight will be Lomachenko’s first since undergoing arthroscopic surgery on his right shoulder following his tenth round knockout of Jorge Linares. Lomachenko says he had an “interesting” training camp testing out his surgically repaired shoulder in hard sparring sessions, and is confident it will hold up to the angles and punches he creates. Perhaps he can check out Central Park if he gets past Pedraza (25-1, 12 KOs), a winner of three straight since his lone defeat to Gervonta Davis by seventh round stoppage to begin 2017. Pedraza won the WBO lightweight title with a thorough pummeling of Raymundo Beltran in August, scuttling plans for a Lomachenko-Beltran fight. “I have visualized all the possible scenarios. I’ve seen myself winning, I’ve seen myself knocking him out, I’ve seen myself pulling out the victory coming from behind. The closer the fight approaches, the more I see myself with my hands held high and with the two titles on my shoulders,” said Pedraza, a 29-year-old from Miguel Cotto’s hometown of Caguas, Puerto Rico. It’s safe to say that Lomachenko has visualized something very different. Lomachenko-Pedraza will also feature the New York debut of Isaac Dogboe (20-0, 14 KOs), the WBO junior featherweight titleholder from Ghana making his second title defense against Mexico’s Emanuel Navarrete (25-1, 22 KOs). Dogboe, who is also a college student at Penn State, led several “Neho!” chants throughout the press conference, even getting promoter Bob Arum to get in on the action on-camera. Navarrete, whose lone defeat was on points in his sixth fight, nearly cracked up when Dogboe did the chant at their staredown. On the undercard, 2016 Olympic super heavyweight Guido Vianello will make his pro debut. The 6’6″ big man from Rome, Italy lost a 3-0 decision in Rio to Cuba’s Lenier Pero in his first fight before electing to turn pro under the tutelage of Abel Sanchez, who also trains silver medalist Joe Joyce from the other side of the bracket. Arum says he’s yet to see the 24-year-old Vianello fight but holds the glowing opinion of Sanchez in high regard. At the press conference, Vianello described his boxing style as a mixture between Muhammad Ali and Klitschko (he didn’t specify which), raising expectations even higher. Vianello, a former police officer back home, will face Luke Lyons (5-1-1, 2 KOs), a 33-year-old from Ashland, Kentucky, in a six-round fight.